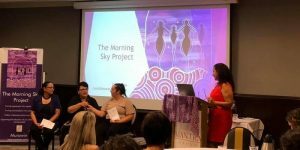 The Morning Sky Project are workshops for Indigenous women in business. It is a collaboration of Murawin and IBA and designed to support participants to validate their business ideas and establish a business model, in a culturally embracing and peer learning environment. These workshops, delivered by Carol Vale, Principal Consultant, Murawin, cover topics such as: developing your value proposition, identifying potential key partners, resources and activities, building customer relationships and segments, cost structures and potential revenue streams. Learn about running your own business, managing finances, striving for financial security and accessing procurement opportunities. A One Day Session including: Getting Ready to Start or Grow Your Business and Communicating with Influence and Pitching Workshop. Aboriginal and/or Torres Strait Islander aspiring, early-phase or established business women. The free workshops take place at various locations around the country. Check out the full workshop link. If you have any questions, please don’t hesitate to contact Debbie Hoger at [email protected] or call on 0417 405 727.